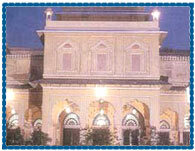 Hotel Narain Niwas Palace Jaipur, Narain Niwas Palace Hotel Jaipur, Reservation for Hotel Narain Niwas Palace, Jaipur, India. Address: Kanota Bagh, Narain Singh Road, Jaipur  302004, Rajasthan, India. Accessibility: 11 kms. from Airport, 5 kms. from Railway Station, 4 kms. from Bus Stand. 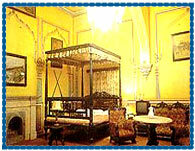 Hotel Narain Niwas is centrally located in Jaipur, built in the 19th century by General Amar Singh Ji, Thakur of Kanota. Hotel is designed in a fanciful version of The Anglo-Indian style, offering a traditional Rajput hospitality with all the modern amenities to its guests for a great comfort. Hotel offers 31 tastefully appointed rooms and suites maintaining the traditional furniture and decoration to provide an unforgettable Rajasthani experience with all the modern amenities like telephone and attached bath, running hot & cold water. Banquet Facilities, Cocktail Bar, Currency Exchange, Laundry Facilities, Lounge, Parking Facilities, Restaurant, Room Service, Safe Deposit Box, Swimming Pool, Airconditioning, Cable / Satellite TV, Private Bathroom / Ensuite, Telephone.